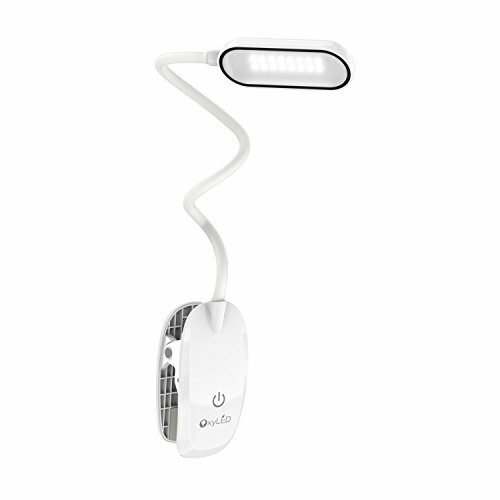 OxyLED Eye-Care LED Desk Lamp, USB Rechargeable Vertical Clip Lamp with Flexible Gooseneck for Student, Dormitory, 5W, White, T36, Back to School Supplies by OxyLED at Momiji Studios. MPN: T36-NEW. Hurry! Limited time offer. Offer valid only while supplies last. OxyRead - Study, Work, Relax The OxyREAD T36 Desk Lamp provides a flash of functional flare to any home or office space with a touch of artistry. The OxyREAD T36 Desk Lamp provides a flash of functional flare to any home or office space with a touch of artistry. With 16 adjustable LED bulbs, this detachable lamp defuses a warm, constant light to bring you through the perfect page turners, or give you the focus needed for pulling those all nighters. This dimmable desk lamp emits a warm glow that gracefully fade without flickers, so your eyes won't be left squinting at sudden changes in light levels. The lamp head's translucent white filter ensures that the light radiates with the right yellow-white light balance, for a beautifully illuminated space every time. In addition, with a strong clamp and flexible neck, this lamp can be adjusted to any angle and mounted to the bedframe, office table, study room desk, and much more. Choose to power this lamp either by USB power or with a built-in 1200mAh battery, so you can use it during power outages, or even in the great outdoors. Protect Your Eyes: With 16 adjustable warm LED bulbs that creates a flicker-free, anti-glare warm and constant light without ghosting, it glows with maximum comfort for your eyes, whether you're reading, working or cranking out a report.